I have often mentioned that the lawn has become the major remnant of the English garden still present in the American landscape. We have no fences containing that lawn. It is free to run into the neighbor’s lawn. That is the American contribution to the English lawn. 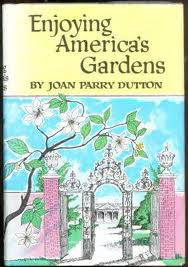 English gardener and writer Joan Parry Dutton recognized that in her book Enjoying America’s Garden which she wrote after her visit to America in the 1950s. She said: “If I were asked if there was one single feature of American gardens as a whole which had caught my attention, I would unhestitatingly say the lack of hedges.” Hedges meant any kind of enclosure including a wooden or metal fence. In earlier American gardening it was a different situation where animals roamed the property on farms and suburban areas outside cities. There a fencing of some sort was necessary especially for maintaining a vegetable garden close to the house. Fences may have been popular in colonial times, but by the nineteenth century move to the suburbs, the fence became a thing of the past. The American garden enjoyed the open lawn that seemed endless as it flowed into the neighbor’s green.